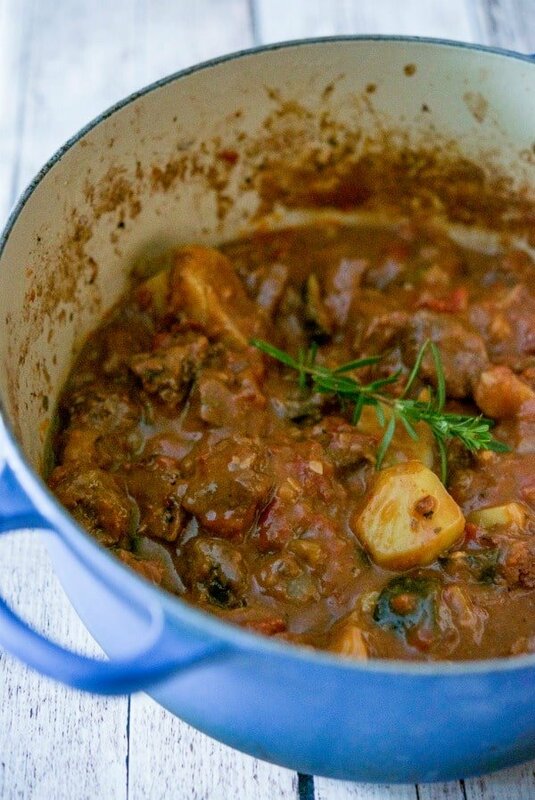 Beef stew made with zucchini, garlic, onions, fire roasted tomatoes, fresh rosemary, horseradish and red wine is unbelievably delicious. I don’t know what it is about the first leaves falling off of the trees that set off an internal alarm that it’s time for comfort food. Do you react that way too or is it just me? I love Fall in NJ not only because it’s simply beautiful (especially where we live), but it means cooler temperatures which means to me that it’s time to make more comfort food like chili, roasts, and stew. 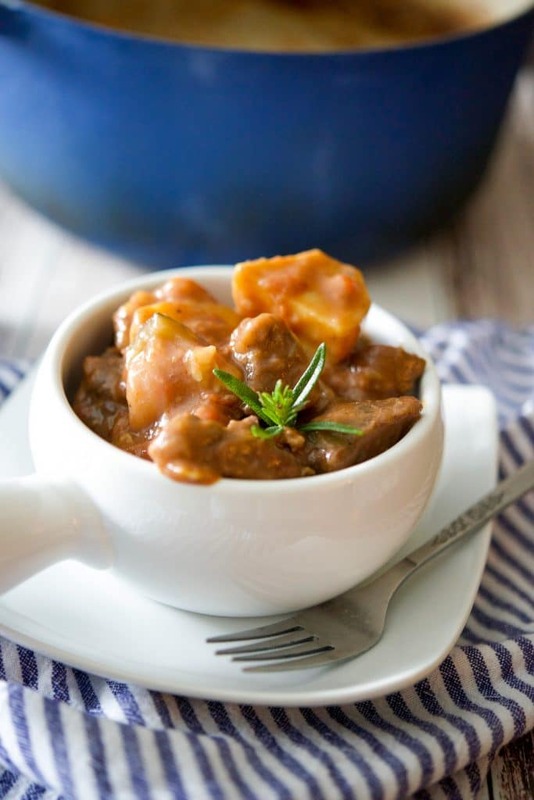 Not only is beef stew delicious, it’s hearty and definitely warms the soul. 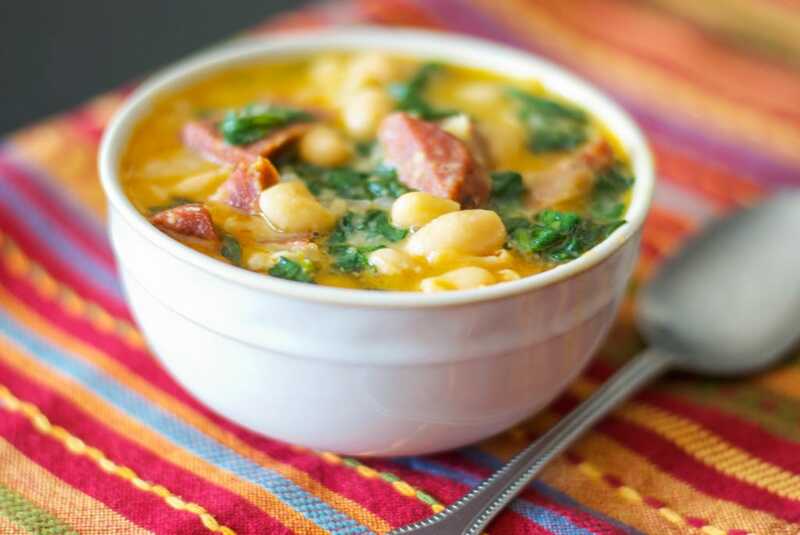 I haven’t made a new stew recipe in a while because I generally make this one, so I figured it was time. 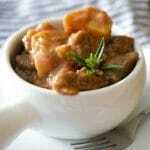 When purchasing meat to make stew I generally don’t buy what your local grocery store calls “stew meat”. Most of the time it’s more expensive than getting a London broil because it’s already been trimmed down for you. 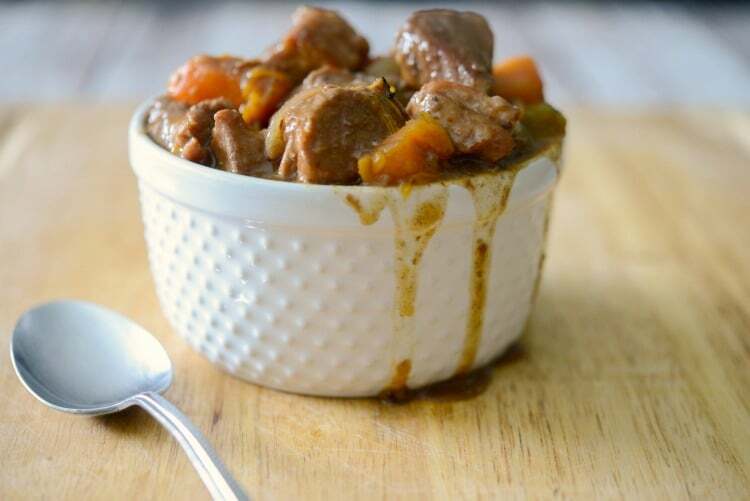 For a more information on which meat is best for stew, read this article from Serious Eats. For this recipe, you’ll need beef cubes, zucchini, garlic, onion, fire roasted diced tomatoes, flour, prepared horseradish, fresh rosemary, beef broth, and dry red wine. Start by cutting the meat into 2-inch to 3-inch pieces, season them with Kosher salt and fresh ground black pepper; then add them to a Dutch oven or large pot that has been heated with a little EVOO. Lightly brown the meat on all sides for about 5-6 minutes; then add your zucchini, garlic, onions, and rosemary. 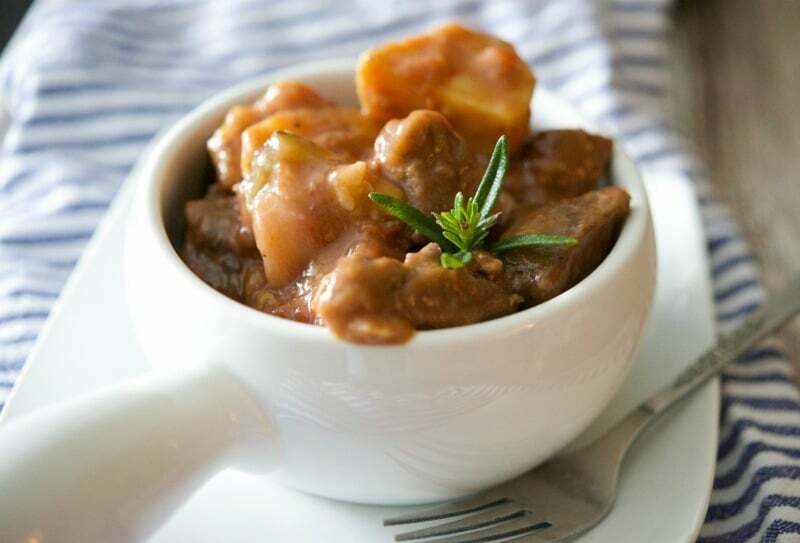 Cook for another 1-2 minutes until the vegetables start to soften; then add flour to coat the meat and vegetables which will help thicken your stew as it simmers. Add the diced tomatoes, horseradish, beef broth and red wine (save a sip for yourself 😉 ); mix well. Partially cover the pot with a lid, reduce heat to low and allow stew to simmer for 1 to 1 1/2 hours; stirring occasionally until the meat is fork tender. If you like potatoes in your stew like my family does, peel 1-2 medium size potatoes and cut them into large pieces; then add them to the stew 30 minutes before you plan on eating. 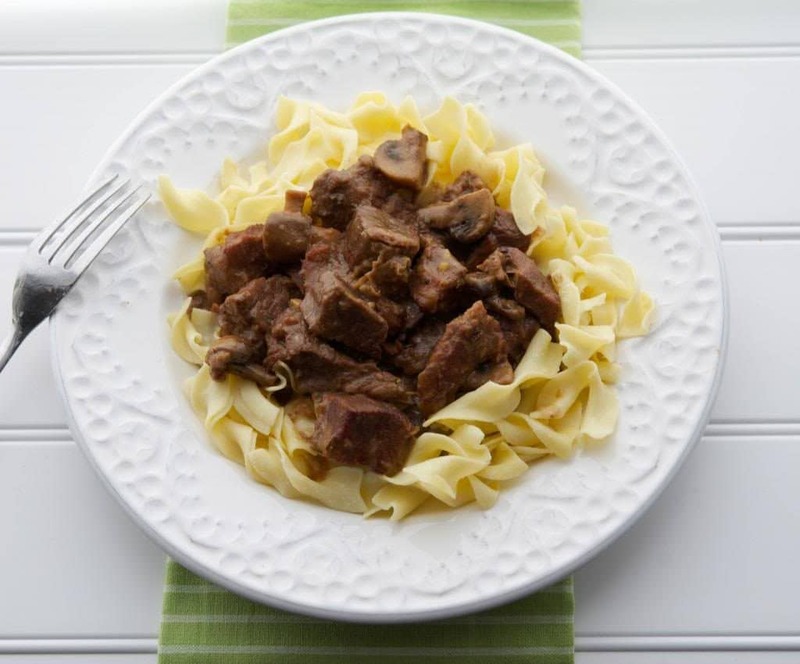 We ate this Beef Stew in a Red Wine Sauce ‘as-is’ with a tossed salad, but if you’re going to serve yours over noodles or rice, I suggest leaving the potatoes out so you’re not in ‘carb overload’. ~Enjoy! Cut the meat into 2-inch to 3-inch pieces, season them with Kosher salt and fresh ground black pepper; then add them to a Dutch oven or large pot that has been heated with the oil. Lightly brown the meat on all sides for about 5-6 minutes; then add your zucchini, garlic, onions, and rosemary. Cook for another 1-2 minutes until the vegetables start to soften; then add flour to coat the meat and vegetables. Add the diced tomatoes, horseradish, beef broth and red wine; mix well. Partially cover the pot with a lid, reduce heat to low and allow stew to simmer for 1 to 1 1/2 hours; stirring occasionally until the meat is fork tender. Season with salt and pepper as desired. *If you like potatoes in your stew like my family does, peel 1-2 medium size potatoes and cut them into large pieces; then add them to the stew 30 minutes before you plan on eating. This post includes affiliate links where I earn a few cents on the dollar when you purchase items using the links I recommend. There is no additional expense to you.